The children of the Southwest represent a critical component of the U.S. child population, disproportionately accounting for both the total and growth of the child population for more than 40 years. 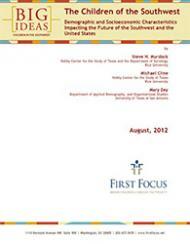 This report, authored by a team led by former U.S. Census Bureau Director Steve Murdock, reveals that minority children accounted for nearly all the growth in the child population in the Southwest, and that children in the Southwest are also have higher levels of poverty, lower incomes and lower rates of health insurance coverage than children in the United States as a whole. What is clearly evident is that the future of the Southwest and the United States as a whole are increasingly tied to the future of its minority populations. Whether the nation prospers or struggles to maintain its current standard of living will depend on how well diverse children such as those in the Southwest do. The Children of the Southwest is the first of the Big Ideas: Children in the Southwest series. The complete publication will be released in the fall, but individual papers are now available. Sign up online to ensure that you receive each Big Ideas paper as it is released.